The dragon Ao Kuang is Lord of the Eastern Sea. His three brothers, Ao Qin, Ao Run, and Ao Shun rule the seas of the other cardinal directions. He and his brothers are fickle rulers, and Ao Kuang’s many ill-reputed sons cause their share of mayhem on earth. Over time this built him a following of fearful subjects eager to appease him. He maintains a vast collection of heavenly weapons and artifacts in his grand undersea palace. Ao Kuang’s reputation made him many enemies, perhaps the most notable of which was Nezha, son of the military commander Li Jing. When Ao Kuang demanded a sacrifice of children to eat, Nezha beat off his minions and killed the Dragon King’s third son, Ao Bing. Ao Kuang fled to the Jade Emperor’s court to plead for vengeance, but Nezha followed him there and beat him severely, ripping off scales and drawing blood. Ao Kuang then took Li Jing and his wife hostage in exchange for Nehza’s life, and Nezha committed suicide to placate the dragon. The Azure Dragon, also known as Qing Long, is a mythological creature which represents the Wood element, spring, and rules over the Eastern direction, which is why it is also sometimes called the Azure Dragon of the East. The Dragon Turtle is a mythological creature whose appearance resembles both the Azure Dragon of the East and the Black Turtle of the South, as it bears the head of the former and the body of the latter. Ancient cultures believed the Dragon Turtle was a symbol of prosperity and longevity, but also symbolized courage and determination, which can be attributed to its fierce-looking appearance and rock-hard shell. Ao Kuang grants you a tsunami to sweep away hostile cities and armies. 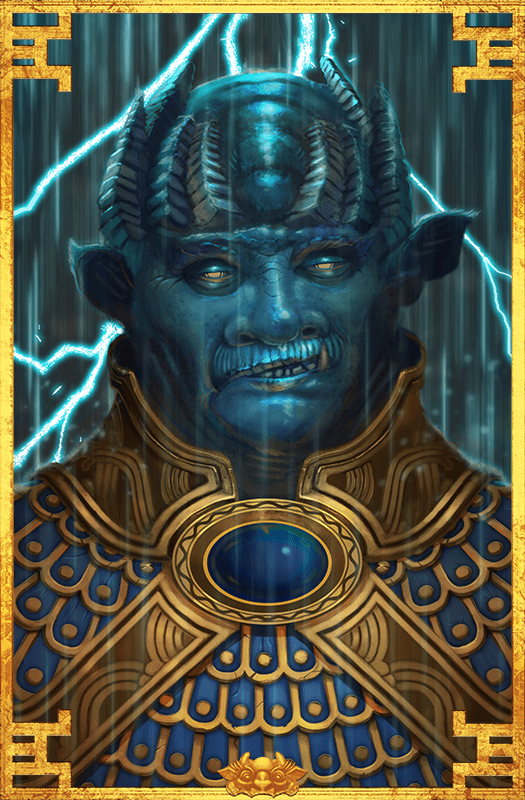 Great Flood: Ao Kuang’s God Power sends a destructive wave in whichever direction you want. Anything that stands in its way will be mercilessly swept away. Dragon Scales: Ao Kuang lends your Human units Dragon scales, improving their hack armor. East Sea: Ao Kuang reduces the cost of your Ships. Nezha’s Defeat: Ao Kuang improves your Dragons, making them stronger in combat.